The Portland Trail Blazers are becoming an increasingly tired act. Overspending and underperforming is leaving Portland fans worn-out on this current Blazers team, and unfortunately, there is little hope for significant turnaround in the near future. Hamstrung by hefty contracts to Meyers Leonard, Mo Harkless, and Evan Turner, the Blazers have little opportunity for improvement as it is looking more and more likely that they will have to ride out the bad contracts they took on in the summer of 2016. The Blazers dynamic backcourt duo of Damian Lillard and CJ McCollum proved to be less dynamic in the playoffs, leaving the rest of the team to carry a heavy load, something they weren’t accustomed to or capable of. The road to success looks long and bumpy, but does it have to be? What the Blazers currently have going right now clearly isn’t working, maybe it’s time to shake things up a little. Or a lot. The Blazers aren’t going to trade Damian Lillard. He’s the face of the franchise, and in some respects, the city, and the team’s management would never hear the end of it if they shipped Dame away. They also aren’t going to get rid of Leonard, Turner, or Harkless simply because they can’t. Their contracts are too gaudy when compared to their on-court outputs and they just aren’t going to find suitors with any real assets to get in return. It is a tough pill to swallow as a Blazer fan but it is an unfortunate reality. Jusuf Nurkic also doesn’t appear to be the perfect fit. His glimpses of power and brilliance are overshadowed by his laziness and inconsistency. He will no doubt cost a lot to keep around and could very well end up being another handicapping contract for the Blazers’ future. 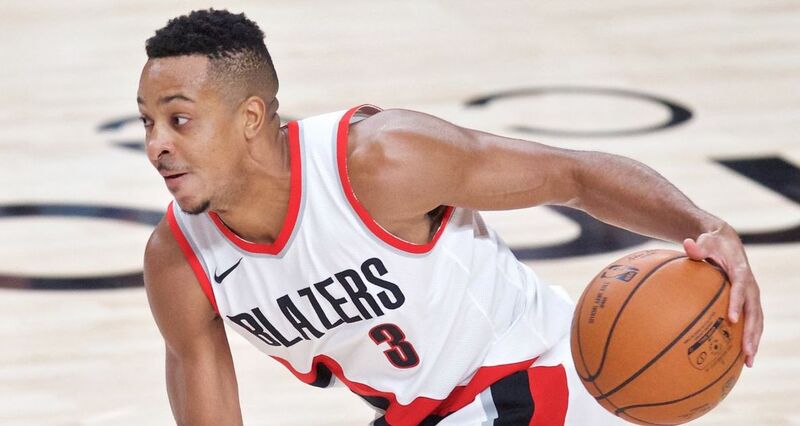 However, they do have one player who would surely be coveted on the trade market and would bring in substantial and potentially franchise-altering returns: CJ McCollum. This would be an unpopular move, but could allow for the Blazers to move away from an offense centered around just two key pieces (which as we saw with New Orleans, can be completely stifled) and instead give rise to a more team-oriented style of play. CJ is great at creating his own shot, but looked less-than-stellar during times when Damian was either injured or locked down. The two of them are also sub-average defenders, and in a league dominated by guards, this is not a great combination to have. CJ’s departure would surely be cause for sadness among some Blazer fans, but it may be just what they need to finally break through into the league’s upper echelon of teams. This trade would be a little tricky as Parker is a restricted free agent this summer but it would give the Blazers a very capable scorer who can knock down a 3, play defense, and someone who isn’t a completely ball-dominant guard. He would slot nicely into a front court spot, and he would be a fun pairing with Damian as he is incredibly athletic and versatile. With this 17th pick, the Blazers would have a nice shot at drafting someone like Gary Trent Jr., a Duke freshman capable of helping the Blazers out immediately who can shoot very well, defend, and has an NBA-ready body. If they were able to then bring in someone like Montrezl Harrell or Julius Randle on a free agent contract, the Blazers would have an interesting array of starting lineup possibilities, especially if they feel like Zach Collins is ready to take the next step in his career development. With Damian Lillard, Gary Trent Jr., Jabari Parker, Al-Farouq Aminu, and Zach Collins/Julius Randle/Montrezl Harrell on the floor, the Blazers could play an up-tempo game and would be adept at defending a multitude of lineups. They would have trouble scoring at times but it would be an interesting experiment, especially if Zach Collins can build off of his impressive rookie year campaign and show he can handle being in the starting lineup. Then, for their bench, the Blazers would be smart to bring in a guy like Jamal Crawford or Tobias Harris, someone who can get their own shot off the dribble, but still has the shooting capabilities to play within an up-tempo Blazers offense and play with the starters when need be. This is a lineup that might take a few years to develop but would seem to have the ability to play well in today’s NBA, especially if they Blazers began playing more up-tempo and emphasized fast-breaking and defense. If they hang their hat on their defense, like they did this past season, they will give themselves a chance to win every night. Much of this proposed lineup’s success depends on the long-term development of Zach Collins. If he can become a capable defender, which he showed he has the instincts for, and continue to develop his 3-point shot, this could be a really fun lineup to watch. The Blazers have nothing to lose at this point as they seem to be stuck in the dreaded rut of NBA mediocrity. It’s a scary place to be that necessitates change, and this is one way for the Blazers to do it.